Like fishing nets, Klee's formal themes dive into the sea of the unconscious in order to bring past experiences to the surface of the work. His work, which is extremely thoughtful, is wholly concerned with the development of formal themes, so much so that all figurative form remains at the primary expressive level of a sign bordering on a pictograph. Whether it is a question of forms or themes, Klee's work is filled with a richness that no other painter of this century has attained. No one else but Klee has scrutinized artistic means more closely: line, surface, body, space, value and tone, chromatic value and structure - or better adapted them to suit his purpose. No one else but he has welcomed and brought forth from the unconscious into the visible world such variety: plants, creatures, humans, houses, tools, vehicles, gardens, mountains, stars . . . Ad Marginem (On the Edge) has its point of departure in a purely formal idea of pushing plants and crystals from the four edges of the frame toward a meeting with the dark sun, which from the inner part of the picture draws forth their afflicted growth. A fabulous world from far away, engulfed, covered with rust and lichen, and flecked with stains, seems to be rising up. 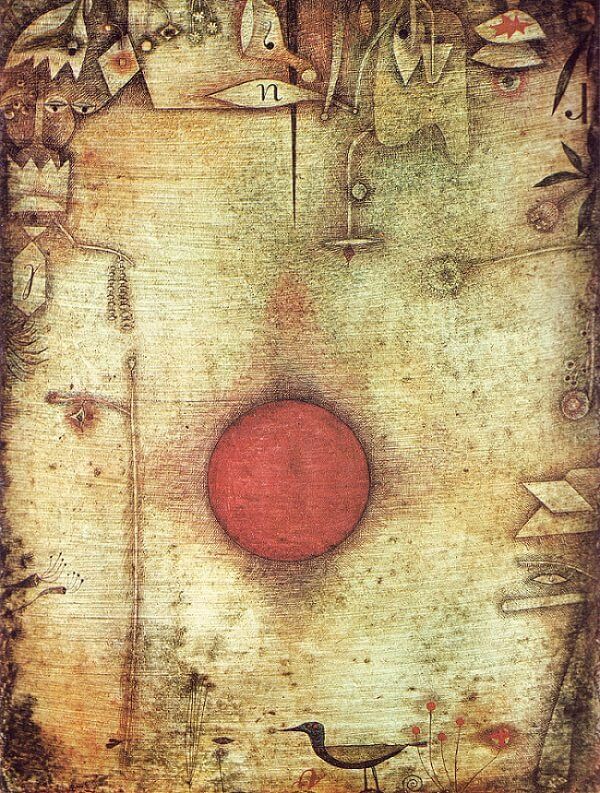 "The sun warmed by mist, which then does battle with it," wrote Klee in an 1899 poem. This painting was done in 1930, during the Bauhaus period. Klee went back to Bern in December of 1933, and during 1935-1936 he worked again on this watercolor. The veil of melancholy that stretches over it accords with the change in his feelings as wel as his environment. "I have met the animals of the soul, the birds of intelligence, fish from the heart, and the plants of dreams," wrote Rene Crevel in 1929, "tiny creature with boundless eyes, sea-weed free of any rock hello-to-you and thank-you beings, vegetation, ant things who cannot live in the world we know, bu who nevertheless seem more stable and real in you surreal intangibility than our houses, gasburners cafes and banal loves." This painting takes us to the edge of things, wher we are haunted by these marginal figures on th borders of reality itself.